The misery, the exquisite tragedy. The Susan Hayward of it all. The exquisite opening to quintessential ’90s flick My Best Friend's Wedding takes a flirty romp through nuptial clichés and throws them to the wind, becoming a complete film unto itself. A flowery prelude that sets the stage for a rollicking and subversive rom-com, the title sequence uses the film-before-the-film approach, featuring its own cast separate from the main production: performers Raci Alexander, Jennifer Garrett, Kelleia Sheerin, and Bree Turner, with Ani Difranco singing a modern take of Burt Bacharach and Hal David’s classic “Wishin’ and Hopin’”. The live-action opening, conceptualized by director P.J. Hogan (Muriel’s Wedding, Confessions of a Shopaholic) and choreographed by performer and dance legend Toni Basil (“Mickey”), immediately signals to audiences that this film is intended to be set apart, and that its trajectory may not take the expected course. The sequence does much to elevate My Best Friend’s Wedding beyond its station, harkening back to the whimsy and sheen of Golden Age film, imbuing a sense of pomp and nostalgia at the outset. It could easily be placed alongside the openings of 1950s films like Pillow Talk, Auntie Mame, and Artists and Models. It also lays the groundwork for the main musical number of the film, a singalong of “I Say a Little Prayer for You” led by George Downes (played by a particularly suave Rupert Everett). 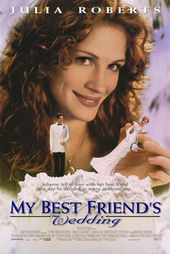 In 1997, My Best Friend’s Wedding was a global box office hit and is now considered one of the best romantic comedies of all time. Upon its release, the film’s title sequence was a rare bird, combining dance, song, and Hollywood glamour. It remains so to this day. A discussion with My Best Friend's Wedding Choreographer TONI BASIL and Title Designer WENDEN K. BALDWIN. It's great to get to chat about this! Maybe we can do a quick introduction first. How would you describe yourself or your career up until this point? Toni: My career has a pretty wide range, as far as being involved in all the street dance community. I’m a director, and a choreographer, and a creator. I was one of the original Lockers, and the Lockers, in 1973, were the first street dance group to go on television and actually earn a living. This last year, I co-directed – with Bette Midler – and choreographed her USA pop concerts and the UK tour. And that took all of the year, trust me! And then I also judge international street dance championships. Recently I was one of four livestreaming commentators for KOD, which is Keep On Dancing, a Beijing–China international street dance battle that they ended up having here [in LA], in huge venues. Wenden: I would say... I would use the word “diverse.” I've done a lot of different things. I started out in advertising when I was pretty young and also when I was going to art school. And from there, I went to Cannon Films, but not as a title designer. I was working in their marketing department – their advertising department, doing print advertising. I basically started the title department there because they did everything in-house. Everything that was post-production related was done in-house. I just happened to start doing credit blocks for trailers and then I started doing titles. I was at Cannon for quite a long time, that was like a 12-year job or something like that. From Cannon I went to CRC – Cinema Research – they did optical effects and titles. That was where I did My Best Friend's Wedding. In the ’90s, what were you up to? Do you remember what you were doing around this time? Wenden: I was working at CRC at the time, and one of the great things about working at CRC is you'd have all these great directors coming to you just because they wanted to get their films done. It's kind of surprising how many directors would use the art department at CRC. It was kind of a one-stop shop. I hate to use that phrase but in a lot of ways it was. So, he was a client at CRC. You’re referring to P.J. Hogan, the director? Wenden: Yeah! P.J. Hogan. The one thing I remember most is that he was really, truly excited about the sequence. He was just totally excited, like he bought into it and really loved it and it was obvious he had this great sense of style and aesthetics. It seemed like taking this route for the titles was kind of an intuition on his part. He just felt like it was going to really resonate with people. He was totally just excited about it, that's one thing I remember. So, how did working on the titles to this movie come to you, Toni? Toni: I was already working on the film. I had choreographed My Best Friend’s Wedding. There were some sequences that needed a bit of staging… There were some dances at the end. What was the name of the guy that starred in it also? Toni: Yeah, Rupert! I worked with him a little bit, and Julia [Roberts] a little bit. But I had worked with P.J. on the movie, so he called me up to do the titles. He described it to me over the phone: pink background, complete pink background. I was familiar with working on coloured voids, because I had done “Mickey” and many of my videos on white, and he was doing this on pink. He had picked a song, and he wanted me to create a musical number to go with it. Wenden: In his mind that song was going to resonate with his audience about the story that followed. His vision never seemed to vary. It seemed like the idea had come to him effortlessly, in a sense. Toni: He wanted to use three back-up singers and a lead, and it was going to be brides and the bridesmaids. He described that to me over the phone, so I think the next time we met, we were going to talk about calling an audition for the girls. But he had already picked a bride! Which, when I got there, I realized wasn’t going to work out because she couldn’t dance! Toni: There’s this assumption, you know, that you can just pick a face and teach them how to dance, and this girl had to sing and dance! I mean, to pick an actress that has to sing and dance, rather than to pick a singer-dancer is really an insult to dance. It doesn’t give you any leeway, you’re not able to create! She really couldn’t cut it, so we had to let her go, and when we had the complete audition we auditioned also for the lead. We did a big call. We probably had 50 to 75 people auditioning that day. I really appreciated that P.J. let me change the lead. The lead is named Raci Alexander, and I think she was absolutely brilliant. I think it made all the difference in the world. So, what was your inspiration? How did you determine the narrative for the routine? Toni: We looked at the lyrics and started to see where it would dance, where it would tell a story, and I made a storyboard. All my videos that I choreograph, I draw out. I have the storyboard to “Mickey” and some of my music videos, but I don’t have this one... just my music videos. But my assistant, who was really fantastic to work with on the project – her name is Chrissy Bocchino – and Chrissy was a wonderful comedian, singer, dancer, herself, so she was a great inspiration to the project. We sat down and thought, “Okay, what are the real cliché scenarios?” Throwing the bouquet, all those things. I think we just tried to approach it all with humour and tongue-in-cheek. Toni: Yeah! We just sat down and thought of all these different concepts and ideas. Sometimes a lyric would drive the idea. It’s great how there are changes in the camera angles, because some moments are at a wide angle, some are really close up, and some are from above, and the girls are arranged so that they’re lying down. Toni: Yup, and that was one where we had to make some changes because the building that we shot in, the ceiling was not high enough to get the girls full-figure. You notice that they’re just from the waist-up? We had to change the choreography quite quickly. I remember P.J. – well! He was concerned, he said, you know, the ceiling isn't high enough to shoot what we need to shoot. I said, well, that’s no problem, just get the camera up high enough and I’ll re-choreograph it from what you’re seeing. And that would really have been the downfall of a non-dancer. She could have never made that kind of adjustment. So it was great that we had talent that could adjust. Wenden, after it was all shot, do you remember how you worked with the typography for the sequence? Wenden: I remember it really clearly. It's Bickley Script. At the time, I was doing all my typography, setting all the type. Making sure that everything was perfectly kerned and the spacing looked correct. And since it was a script, you kind of had to eyeball it more than just assume that if something was dead center, it was going to look centered, so there was some finesse involved in getting that type set and getting it looking good on the screen. I was pretty hands-on with the whole thing, producing the typography, making sure that everything lined up, working with the optical printer guys, making sure the wedges were done correctly. I worked with the optical guys downstairs and made sure the elements were shot correctly. It’s a remarkable sequence for the ’90s, but also cinema overall, because there aren’t many movies that begin with a long dance number like this. Wenden: One of the things I like about it is that it takes you by surprise. I really like the opening because I think it's such a great combination of choreography and music and titles. Toni: I’ve gotta commend P.J. for the vision to see it and for having the confidence in hiring me to really, you know, step out and do something! I think it’s a really brilliantly accomplished piece by all of us. By myself, by Chrissy my assistant, by the four women. I think it was a wonderful ensemble piece. Wenden: It doesn't have any of the actors that are in the movie, it's a very kind of '50s opening, you know? And title sequences really weren't like that then. It's a complete piece unto itself. Right, it's kind of like a music video. Wenden: Exactly! Exactly. I watched it recently after you contacted me 'cause I hadn't seen it for a long time and it still holds up. It's just a great opening and sets the tone for the movie in a really unusual way because it steps so far away from typical title openings at that time. Today it seems like people are opting for either very simple title sequences, which are nice, or very complex digital 3D sequences, which I also enjoy. But there's very few live-action openings, to be sure. Do you think you have a favourite title sequence? Toni: I think Pablo Ferro in the ‘70s did some interesting ones. He was a filmmaker and title person. He’s a friend of mine. Wenden: I like title sequences that have been well thought out from different standpoints. Not just design, but in terms of how it's going to lead the audience into the film, what kind of emotional feeling is developing. I think Se7en was a sequence that kind of surprised people because it was a combination of content that hadn't been used before. I mean, use of Xerox, use of very rough, primitive imagery, things like that. That was a great opening to that movie because it set the tone for something that was indescribable... that you had to figure out as the movie played out. I have a lot of respect for that sequence. Speaking of dance sequences, Toni, have you seen Do The Right Thing? Toni: You mean the old Do The Right Thing? Yeah, the Spike Lee! It uses dance as an opening, too. Toni: Sure! Rosie Perez, right? She did the opening titles. She’s a good friend of mine. I think it was, once again, a groundbreaking moment. People really do not give dance enough credit. What it can do and what it can say. 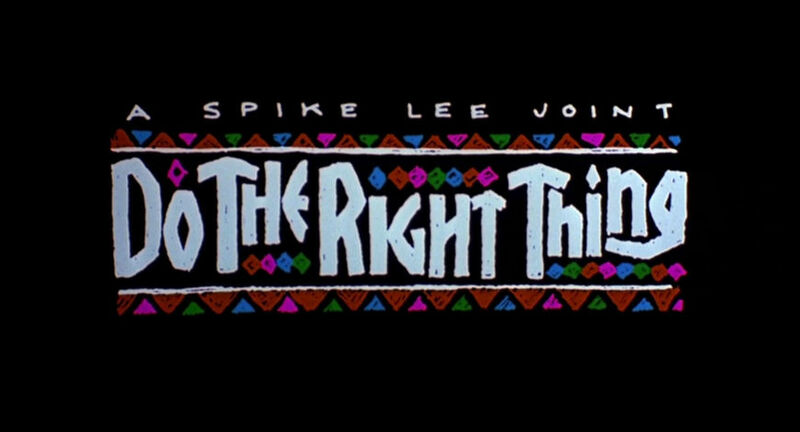 Do the Right Thing (1989) main titles, designed by Balsmeyer & Everett, Inc.
Toni: I mean, you know, my favourite movie is West Side Story. From top to bottom! From absolutely top to bottom. Was it the prologue… in the opening titles? Toni: And right into the prologue! Yeah! Yup. And, I mean, the dancers in that movie and the choreography… I mean, I know the film ran over time, and over budget, but people do not understand what it takes to do dance. Unfortunately dance can be expensive. Dancers have got to be out there with a rented studio, paying everybody to learn choreography. And if you’re going to create ideas, and change things – ”Wait a minute, I like this, I like that!” – these developments take time. Great dance can be expensive, but wow! West Side Story was worth it. Okay, last question here. What do you have coming up? What can we expect from you? Toni: I’m very much into all the international street dance battles, and they are profuse! There are at least 50 to 100 just in Japan of extraordinary quality. Juste Debout, which is the big Paris competition, has 14,000 in attendance. So I’m very much up on all the street dance battles. I’m excited to be judging Hip Hop International, the battles for that. It’s a big American event that’s international. The kids compete from all different countries to win a place to come and compete in Hip Hop International in Las Vegas, which is August 2016. You know, I feel like I’ve been really lucky in my career to have worked with people like Bette and Bowie and Mick Jagger and David Lee Roth and Tina Turner. I can’t believe I’ve been paid to work with these people. I would have paid them! It’s just an extraordinary experience when you work with people like that and you just come out with more knowledge. I did grow up in a show business family, my father was an orchestra leader, and my mother’s side of the family were acrobatic, comedic dancers so I’ve seen everything. I’ve stood on the side of the stage, and I’ve seen Nat King Cole and Sinatra and Judy Garland… I’ve really seen all of what show business has to offer. And I’m grateful to be able to use that knowledge in my work. I think My Best Friend’s Wedding, certainly for the movie, and what we did, is quite exceptional. I’m really proud of that. Titles: Pacific Title, Cinema Research Corp.